Brasserie on the Corner, Eglinton Steet will be holding a fundraising coffee morning in aid of Jigsaw Galway tomorrow Friday,July 3 from 10am - 12 noon. All are welcome so mark your diary. 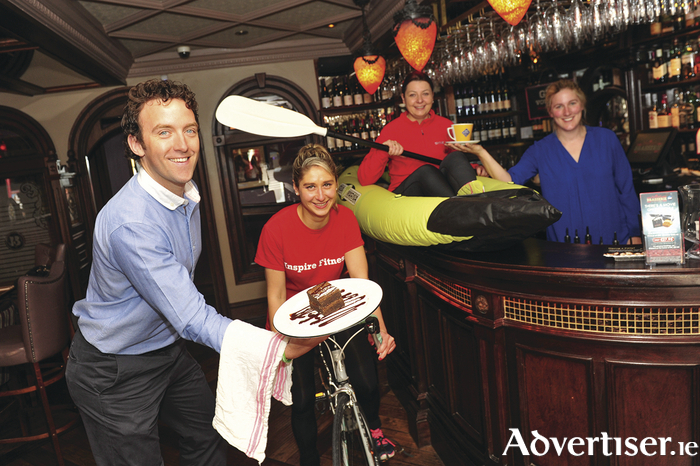 This fundraising coffee morning is being organised by Eimear Killian, General Manager of Brasserie on the Corner, who is a member of the Inspire Fitness team which is taking part in the Womens Adventure Race to raise funds for local youth mental health charity Jigsaw Galway. The Women’s Adventure Race involves 10.5km walk/run, 16km cycle and .5km kayak in the beautiful and rugged surrounds of Killary Harbour and takes place on Saturday July 25 2015. Jigsaw Galway is a free and confidential service supporting young people’s mental health and well-being (aged 15 – 25 ) in Galway city and county. Jigsaw also provides advice and guidance to anyone concerned about a young person in their life. For more information on Jigsaw, drop into Fairgreen Road in Galway City, call 091 549 252 or visit www.jigsaw.ie/galway. Or if you would like to join the Inspire Fitness team at the Women’s Adventure Race you can do so online at www.iregister.ie/InspireFitnessAdventureRaceChallenge or call Justin in Jigsaw Galway on 091 549 252.